Dad, did dinosaurs really exist? Sure they did, son. The Bible says so. They didn’t call them “dinosaurs” back then, but instead they were known as “leviathans” or “behemoths”. But, my science teacher says dinosaurs lived millions of years ago. Is that true? Then how old are they? Well, let’s see. The Bible tells us [from Adam and Eve’s family tree] that the Universe is only a few thousand years old. So dinosaurs had to have lived within the past few thousand years. That’s simple logic, son. Oh. So that means they were on Noah’s Ark? Absolutely! The Bible says two of every animal were brought [by God] to the ark. Dinosaurs were animals. 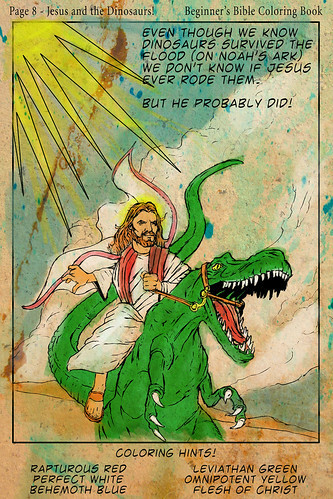 So, using your logic again son, dinosaurs had to be on the ark. Huh. So how come scientists say they’re older than that? and died way before Jesus? No I’m serious. Scientists only find the bones in the here and now, and because many of them are evolutionists, they try to fit the story of the dinosaurs into their view. That’s sad. But I thought scientists were smart? Sure, but they don’t know everything. So they have to make stuff up to fit their beliefs. While you and I, we have the facts, straight from the Bible. I don’t want to be a scientist! Ha! That’s ok, son. It’s better to be right, than smart. C’mon, wanna learn how to flip burgers like your Dad?